View of “Liu Chuang,” 2010. From left: Untitled: History of Sweat, 2004; Untitled: Dancing Partner, 2010. A central figure of Shenzhen’s art scene, Liu Chuang has not exhibited new work since moving to Beijing in 2008. Understandably, his participation in “51sqm,” the ongoing series of small solo presentations sponsored by the nonprofit organization Taikang Space, has been met with some excitement. His project here is spare, consisting of just two pieces that fail to introduce his overall trajectory to a broader audience. Yet the opportunity to observe the directions in which Liu has been working during his hiatus from public life is exhilarating. Untitled: History of Sweat, 2004, involves an air conditioner installed backwards so that the exhaust unit collects the moisture in the air of the gallery space, presumably formed through the sweat of the audience, and allows it to condense in a small puddle on the floor. At its simplest, this is a vision of labor made useless––a bodily product as mechanical coolant––but it also confronts everyday systems of desire and control. 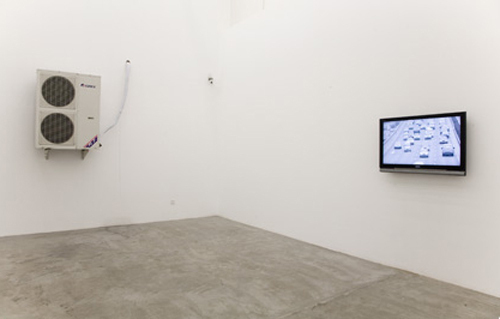 The new work on view, Untitled: Dancing Partner, 2010, consists of a single-channel video that follows two white cars of the same make and model as they navigate the highways of Beijing in perfect tandem, accelerating and turning in parallel while maintaining the precise minimum speed limit throughout. The project could be read as a tribute to Felix Gonzalez-Torres, whose Untitled (Perfect Lovers), 1991, has obviously exerted a certain degree of influence over Liu, particularly in the accentuation of difference through repetition and semblance. Continuing a long-standing investigation of micropolitical systems and hidden social rules, however, Liu takes this conceptual method in another direction: By searching for disruptions immanent to the law, as with the blockage caused by collectively abiding to a minimum speed limit, he approaches fundamental questions of social circulation.